I know we have woodpeckers locally and I’ve heard the damage they can do. I have seen some designs for chicken wire and wood protection but read that garden netting can be as good a deterrent as long as the woodpecker can’t grab hold. I bought some garden netting – holes about 1 cm square – thinking that a few layers would prevent the birds taking hold. reading a little more though, it seemed that it did need to be held at a little distance from the wood of the hive. Anticipating more woodworking I then suddenly remembered a cothes horse type contraption, well past its best, but of four sections that could be placed round the hive. To my delight, the dimensions are near perfect. thank heavens for that thrifty hoarding mentality. So, I folded over a double layer of the netting, twined some garden wore to help keep the netting in place and used string to make two ties so it could be removed whenever I needed as easily as possible. 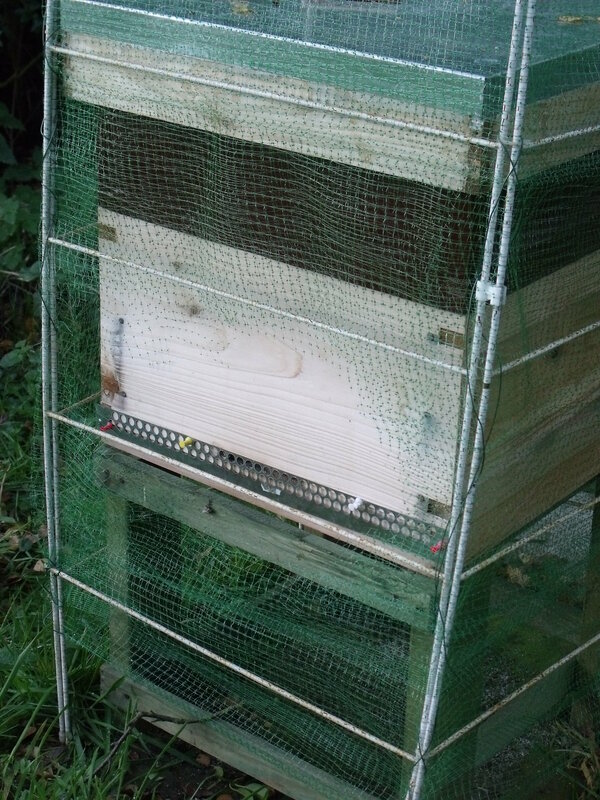 As I put it in place I saw I needed to have a hole around the entrance to be sure the bees could get in and out. This will probably need some refinement. I can see some bees inspecting get caught for a few seconds between teh 4 layers just below the entrance. The bees all seem to have preferred ways of entering. Some seem to dart straight in through the opening with unerring ease. Some slalom in zig zagging in a rather precarious manner but still entering quite cleanly. Others seem to want to land on the hive and take a walk before entering meaning that a larger area free from netting might be essential.